The villa comprises of two floors, one at a higher level reached by the drive and the second below, with the bedrooms, which will access the swimming pool area and the garden. 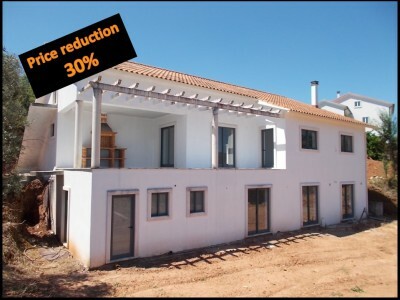 This villa requires approximately €50.000 to finish second stage fixtures and fittings, including; a large swimming pool, kitchen, flooring and plumbing & electrics. This house has been built by a reputable builder in this region, who would be delighted to supply quotes to finish it off. The current owner is also selling a fully finished 5 bedroom restored property with swimming pool for sale at similar price tag to this one when finished, please enquire with us for more details. First floor is accessed from the drive. Through the main entrance door there is a hallway with a staircase reaching the downstairs bedroom quarters and the large 50sqm lounge. This lounge has a large fireplace, on the right it has the entrance to the kitchen which is lit up by plenty of natural light provided by the large windows. In front of the hallway there are two large patio doors which give access to the large veranda. To the right past the kitchen there is a potential fourth bedroom/office with a door leading to the drive. Next to this bedroom, on the left, there is a large bathroom. Off the staircase hallway there is a large bathroom on the left, giving access to three bedrooms, which all have large patio doors. The last bedroom is ensuite with a built in wardrobe area. Just in front of the bedroom doors and the veranda, there is approximately 600sqm of land suitable for installing a large swimming pool with a courtyard area and a landscaped garden. Spacious villa/house in peaceful yet convenient countryside location. Magnificent views of open countryside and the stunning forest landscape in central Portugal. Current owner will pave the drive included in the asking price. Large 50sqm double aspect lounge and diner with fireplace. Full pre installation for central heating and solar panels. Large veranda with outdoor barbecue. Three large double bedrooms (one ensuite) and two additional bathrooms.